Deciding on a Louver style is a combination of how the louvers will be used, the surrounding décor, and your own personal preference. First to think about is how will the louvers be used. For both inside and outside applications knowing the purpose of the louvers is helpful to determine if you need fixed or operable louver blades- then you can decide on louver width. Some things to consider when choosing a width are if the louvers are going to be used for privacy, ventilation, and if you will be adjusting them for viewing. If you prefer to have operable louvers, both narrow and wide louver widths will provide privacy when closed. However, a larger louver blade width will have a wider viewing area since each louver is spaced further apart. Also, a wider operable louver blade will allow for greater ventilation since blades can be adjusted to a fully opened position. The opposite is true with our standard fixed louvers. In a smaller stationary louver greater ventilation is achieved because there are more open areas simply because there are more louvers. When louvers are used to hide appliances make sure that you have the required amount of cubic feet per minute, CFM, of air flow. Keep in mind that fixed louvers do not offer complete privacy but if you like the look of louvers and do not have ventilation requirements you could choose a faux louver which will provide privacy with a louvered look. The next consideration is the surrounding décor. Your home may be anything from Traditional to Contemporary, Cottage to Art Deco but, regardless of styling, any of these could match a narrow louver blade or a wide louver depending on room, window, and furniture proportions. Match the louver size with the scale of what you see. In my last post, “Made to fit vs. Make it fit”, I mentioned proportions and how some are more comfortable then others. For example, a large window with one shutter might not suit smaller louvers but be perfect with wider louvers for a more open and airy appearance. 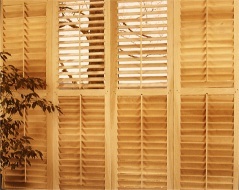 The same window when fitted with several smaller shutters will look proportioned correctly with a smaller louver. Sample louvers can help you see which looks best for the application if you are just not sure. Much like taping paint color samples onto a wall when deciding on room colors and glancing at them at different times of the day to see which one you like; do the same with louver samples, you’ll know in a matter of days which one is just right for you and your home. Did you know? Plantation Louvers may give a hint of a Southern style but it is actually just a generic marketing name that refers to an operable louver shutter with a louver blade that is between two to three inches in width. However, you will find that louver blade widths can be dependant throughout regions due to both climate and cultural differences. 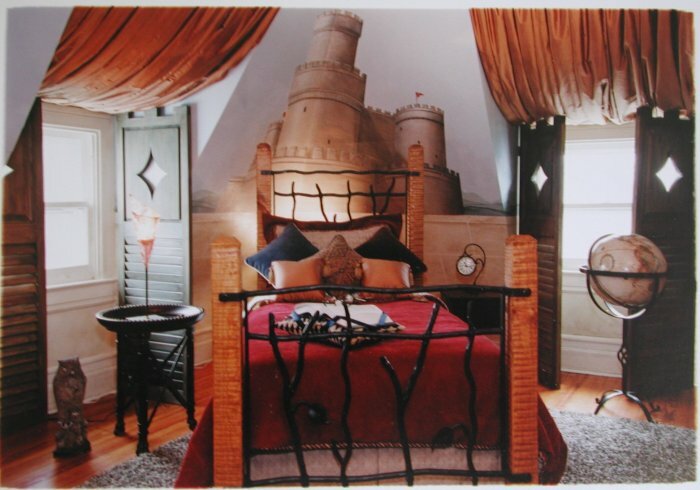 Note: If you live in an old historic home then you also need to consider what the home should have. If you are lucky you will have some of the original shutters but if not check other old homes of a similar style nearby that might have their original shutters. Most likely yours had very much the same. The historic commission in your area should also be able to lend some assistance with old photographs. Made to fit vs. Make it fit. What you think you won’t notice usually does pop out like a sore thumb if it is not proportioned right. There are good ratios to size combinations that just look more comfortable then others and this is one of our goals in making each order. My company looks at these ratios in the preliminary stages rather then just loading widths and heights and cutting wood and then trimming the door or shutter down to size disregarding symmetry and balance. With quick sketches produced by the help of Computer Aided Drafting, simply known as CAD, we as well as the customer are able to see what the end result will be before we even cut any wood. Knowing room locations and usages we are then able to scale in proportions through the varying widths and heights of each opening. This way there is a perfect frame fit both visually and structurally from opening to opening, room to room, that is pleasing to the eye. It’s the difference in buying a true millhouse wood product like ours vs. the production line cookie cutout. 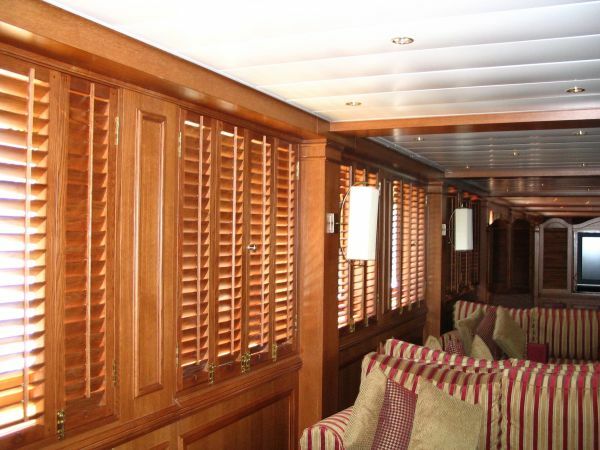 We made these Plantation Shutters out of White Oak and they were installed inside the lounges of a cruise ship that is currently under construction in the Mediterranean. The louvers are tapered and include our signature brass eyelet, tilt bar to louver, linkage. Did you know? When reviewing line sketches that are supplied by manufactures make sure that they are actual take offs from your measurements. Many drawings are only line sketches showing strictly style types and are not meant to be an actual scaled drawing. Note: If you do need scaled drawings from the manufacture do keep in mind that they may be billable.